What do you think the highest grossing Bond film is? It’s probably Skyfall isn’t it? Well, yes, but Thunderball comes a very close second. When adjusted for inflation, and until Skyfall this was the highest grossing Bond film of all time. And it’s easy to see why; Thunderball is a blockbuster, and the best kind of blockbuster. Being released just after Goldfinger and the start of Bond-mania, Thunderball had everything going for it. Thunderball would have probably been a hit even if it was terrible. But luckily it wasn’t, and it is has become possibly my favourite, Sean Connery Bond film. I know I said that when I reviewed From Russia With Love, but it is hard to compare the two. While FRWL does contain similar things, such a the SPECTRE sub-plot, Thunderball is a wholly different movie. While FRWL was a slower spy thriller, a product of cold war-era spy espionage, Thunderball is more of a timeless, escapist action movie, more in the vein of Dr No (both Thunderball and Dr No were directed by Terence Young). It’s a credit to the Bond series, that each film can feel so different. 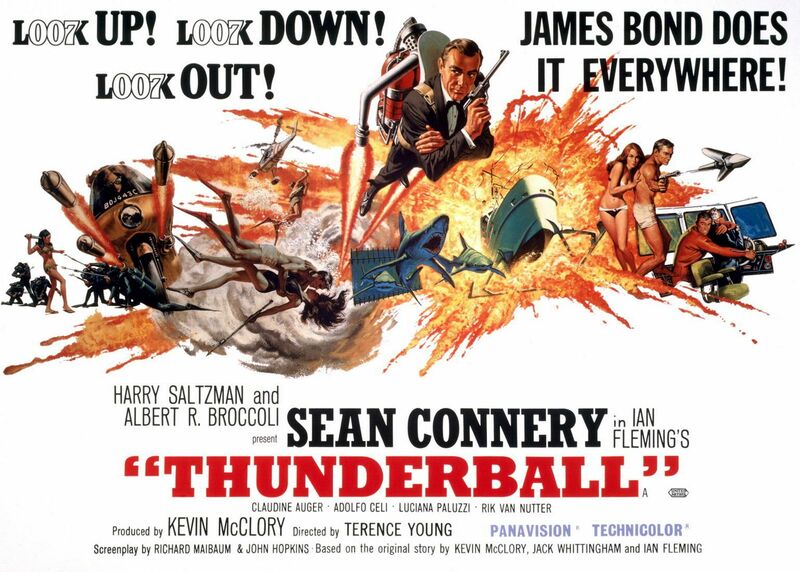 Thunderball, with its plot about nuclear missiles, is very much influenced by it’s time, what with the Cuban missile crisis only a few years before. But this doesn’t make the film any less timeless and the plot is undertaken with a light, fantastical approach. After SPECTRE steal these missiles (with a plan involving plastic surgery, NATO, and underwater divers no less) it’s up to James Bond to get them back. Bonds adventure starts with a health spa in England and takes him to Miami, by way of the Bahamas. In the Bahamas he encounters eye patch wearing, SPECTRE operative Emilio Largo and his mistress/niece/hostage (her relationship to him isn’t made very clear) Domino. Along the way there are shootouts in a parade, shootouts at a villa, shootouts on a transforming hydro-foil, car chases, foot chases, shark escapes, jet packs and best of all; underwater battles. Those underwater battle scenes are a particular highlight. Never before, or since for that matter, have there been such awesome underwater action sequences in a film. People are getting harpooned left, right and centre. People are getting stabbed, there’s blood everywhere, sharks appear, explosions happen, all deep underwater. It’s awesome, and these moments are reason enough to watch the film. But if that’s not enough, the film also contains perhaps Sean Connery’s best performance, some great scenes with Q and very nice cinematography from the great Ted Moore. The Bottom Line: This is classic, escapist Bond. While maybe not as deep or as serious as my other favourite from this era; From Russia with Love, Thunderball is brilliant for being the most entertaing, action packed and just plain awesome Bond film so far. Thunderball has climbed the ranks of my favourite Bond films and now sits somewhere near the top.